It took Apple three years to do it, but Apple Maps is now the undeniable leader in iOS mapping, with a usage rate tripling that of its closest competitor Google Maps. According to an Associated Press report, Apple says Apple Maps logs more than 5 billion Maps-related requests each week, a number helped along by ongoing efforts to squash bugs, fix incorrect data points and add new features. The turnaround is as much a testament to Apple's commitment to product as it is to the power of unbridled financial investment. "We are fast learners and we are fast at fixing things," said Greg "Joz" Joswiak, Apple vice president of iPhone, iPod, and iOS Product marketing. "We learned the maps business incredibly fast." Apple's numbers are backed up by market research firm comScore, which noted Apple Maps usage now has a "modest" lead over Google's service. 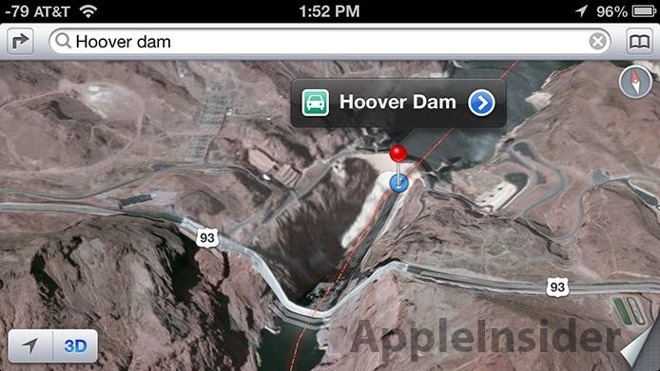 Prior to its own in-house solution, Apple relied on Google Maps for its iOS Maps app. Contributing to the reversal is Apple's insistence on using Apple Maps as the default iOS service for embedded maps. Along with first-party apps like Siri and Mail, third-party titles also have the option of incorporating Apple Maps for location finding, POI queries and more. Most recently, Apple added transit directions in iOS 9 covering buses, trains, subways and other pubic transportation alternatives, a much-requested feature that has been available on competing services for some time. Powering Apple's version is technology gleaned from HopStop and Embark, just two of the many acquisitions Apple conducted in the name of building out Maps. Other buys include Coherent Navigation, a high-accuracy GPS technology company. Apple is also moving forward with internal initiatives to bolster the Maps experience. Over the years the company has hired numerous "ground truth" experts to confirm POI data and partnered with data aggregation firms for business listings, traffic, imaging and other mapping services. The report said Apple now taps more than 3,000 sources for such information. Looking to the future, Apple earlier this year launched a stealth program involving sensor-and camera-laden vans. The company later confirmed ownership of the mobile surveying platforms, saying the data would be used to "improve" Apple Maps.